On the island of Ceylon, 1971, my parents and I were frequently invited by hospitable friends to their weekend home in one of the coastal towns. Their front door opened onto a lush colorful garden with a meandering path ending at the banks of a deep and sluggish river whose opaque brown waters we stupidly jumped into to swim, in spite of the river snakes and other sneaky fanged creatures slithering unseen beneath the murky surface. The road leading to and from and through the village was lined with small houses and shops and bustled with cars, bicycles, cows, elephants and their mahouts, shrieking monkeys, turbaned snake charmers, skinny swamis, and colorful slews of lunghi- and sari-clad locals; all jockeying for room to go about their daily cart-pulling and basket-toting business. We careened through the countryside to and from the enjoyable weekends, fighting the disequilibrium of driving on the wrong side of the winding road, occasionally suppressing the nausea long enough to beg the driver to pull over so that we could pick from the bushy trees at the side of the road, branches heavily laden with rambutan. We ate these lichees in the bouncing car, popping the white globs of fruit from their prickly red rinds, groaning with pleasure at the exotic floral flavor and tossing the empty skins out the windows to be scavenged by the wandering wildlife. The house was open to the muggy elements and at night we slept al fresco in cots scattered throughout the wrap-around porch, shedding our pajamas under the thin sheets, slapping throughout the still, black night at the whining bloodthirsty mosquitoes and awakening at sunrise to the maddening itch of our many new bites. The back of the house faced the roaring Indian Ocean, and the beach was generally deserted except for the occasional sea turtle lumbering her pregnant way up the white sands to patiently dig a shallow hole in which to plop her ping-pong ball eggs as we amazed humans quietly watched from a respectful distance. On the road, we gawked and marveled at the toddy tappers walking through the air in the jungle canopy high above our heads. 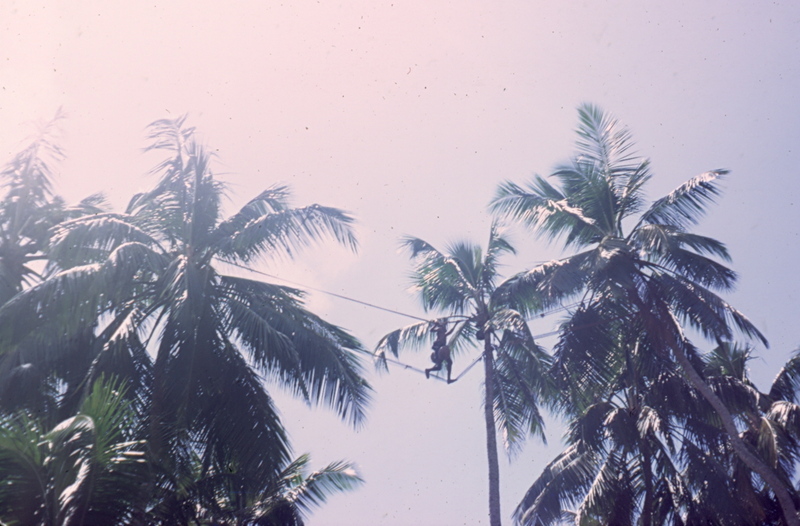 Those plucky nimble men scurried along tightropes strung between the tall palm trees of the dense coconut groves, tapping sap from coconut flowers and collecting it into gourds. Also known as the poor man’s drink, the quickly fermenting liquor was supplied to eager customers lined up at the local toddy shops, and on every trip, as we drove by the coconut groves, we heard sad tales of foolish toddy tappers nipping at their toddy, losing their toehold on the tightropes and sailing from the treetops to the damp jungle floor far below. Toddy was tasty enough, but it was in the buzzing humidity of Ceylon, where everyone glistened with the golden sheen of curried perspiration, that I learned to deeply appreciate an ice-cold gin and tonic; and where, in the warmly welcoming home of our wonderful British hosts, I tasted for the first and absolutely very last time, steak and kidney pie. What an amazing experience for you. What also strikes me is that you survived without cholera or malaria. It may have been a greater place for a brief visit, rather than a station/residence. Did you get many American visitors there?